In the aftermath of Rogoff and Reinhardt’s study on debt sustainability and growth, economists seldom enquire on the inevitability of public debt for growth. Marianna Mazzucato and Stephanie Kelton each advocate, in a particular way, that public spending and thus public debt contributes to economic growth and development. Other economists, including Nobel laureates Mundell and Krugman, also acknowledge the role of public debt in underpinning or stimulating economic activity. Less frequently, economists explore public spending as necessary to achieve society’s growth objectives. Private investment strains resources often funded by the public sector from infrastructure to knowledge that increase the pressure to ramp-up public spending. Using US data, I regress earnings, spending and saving of each public, corporate and consumer sectors of the economy on GDP-weighed debt to produce a close-to-fit model of variables explaining debt. Notice these regressions are applicable only to the US economy – different economies exhibit different relationships between public revenue and spending, with significant implications to debt accumulation. I also regress the same variables on nominal public debt to improve fitness. Research by Owoye and Onafowora explores the causal links between tax revenue and spending, observing the existence of a neutral relation between public revenue and spending in the United States, comparable to the results attained in the Toda-Yamamoto research. Owoye and Onafowora do find a statistically significant causal relation between revenue and spending in other countries that suggests government may opt to offload some of the investment burden to public debt. These results substantiate positive regression coefficients for both Tax Revenue and Real consumption of fixed capital: government may increase spending (for instance in fixed capital) when revenues increase, offloading some of the effort in debt. Arguably, the results suggest some form of Institutional Separation operating in the US where an increase in revenue or spending does not imply a concomitant increase or contraction of the other. The results for total expenditure are understandable in the context of how the US government uses current expenditure to smooth the business cycle in the private sector (by stimulating employment creation that would otherwise depress revenues) and spread the cost of capital investment through several budgetary cycles. The latter explanation is concomitant with the significant role consumption of fixed public capital in explaining the US debt burden. As public spending infrastructure seems the most significant determinant of public debt, it is not surprising to find coefficients different from zero in what concerns corporate earnings, spending and saving. Firm profitability seems to increase public debt, the effect becoming stronger as I lag the variable by up to three quarters without affecting significance. Profitability is an intervening variable in public debt through Net Government Saving (that becomes less significant as I lag Profitability) as accounted for by the Levy equation: corporate profits increase with the public deficit, thus increasing profits imply lower debt. Concurrently, the Levy equation indicates net investment negatively affects government saving, typically implying increasing debt. The macro entity hints at the micro foundations of how firm behaviour determines public debt. Levy’s framework assumes government spending increases corporate profits, thus that negative public saving (or an increase in public debt) sustains the profit level. By lagging Gross fixed capital formation by a quarter, I find thatGovernment Consumption of fixed capital would increase by 126% to compensate for lower corporate investment. These findings are complacent with both demand-side public stimulus and crowding-in of public investment by private investment through the marginal productivity channel. Public investment crowding-in is plausible in the context of small, open economies (price takers) who increase exports such that the net international investment position improves. Both through the marginal productivity of investment as through subdued pressure on interest rates, private investment enticed by e.g. increasing exports invites the public sector to increase capital expenditure that is mostly financed by debt issuance in the United States. Research has long established a firm link between employment (or nonfarm payrolls) and budget deficits – hence debt levels – either causal or co-integrated but certainly of opposite sign as illustrated in the following chart reproduced in Fedell and Forte who find unemployment is a long run cause of fiscal deficit. The negative sign is thus less surprising as an increase in employment seems to reduce debt. The large coefficient found between consumer spending and public debt contradicts Ricardian equivalence while confirming Summers’s and Carroll’s results: consumer spending crowds-in public spending as both are inherently linked to foreign inflows. Summers and Carroll solve the contradiction between both positive coefficients in consumer spending and saving by observing that disposable income and the private saving rate increase in tandem with earnings – arguably, foreign inflows also fund corporate investment (that retains the expected negative coefficient observed above). The apparent Ricardian effect is likely due to foreign capital inflows, measured by liabilities to foreigners, depicted in the following regression results with positive sign when regressed on household saving. I’ll write before others start doing so, and I’ll write it now although I’ve known it for many years now: solidarity should not be applied to macro-prudential or financial or economic failures of this European Union. Solidarity is meant as helping in emergency, as explicit in the Treaty. There has been a flurry of wrong references to solidarity as the legal basis underpinning EFSF, ESM perhaps even EFSI, from Chancellor Merkel to President Juncker. While I respect the views of the President of the European Commission, I opt for a strict reading of the Treaties and boldly claim that, inadvertently, this confusion underpins much of the nationalism – in Europe but elsewhere too – we see today. AfD, for instance, was founded in reply to this sense of “excessive charity” in the aftermath of the Greek economic collapse. In a forthcoming publication, I shall expose arguments that return Europe to the European Union, finally introducing a correct distribution of costs and benefits, rights and duties (including abiding by the European Semester’s recommendations) of the Member-States of the European Union. A quick take on MMT – what would’ve been the policy followed by the Secretary of the Treasury in 2009? According to this paper by Warren Mosler, the Secretary should lower taxes or create jobs to curb unemployment to impact budget somewhat similarly to that achieved by the 2009 Recovery and Reinvestment Act. Plotting forward the 2003 growth trend employment would be 9% higher by 2011, accelerating the recovery by a full six years, assuming the trend remained uninterrupted. In the non-MMT US during those years, the growth trend resumed in 2011 more than twice as strong as the previous trend. This observation is complacent with Schumpeter’s creative destruction. Schumpeter considered finance an intermediary necessary to both bolster and terminate firms respectively productive and unproductive. Funding public ventures while printing money implies a different rate of return between those and similar private enterprises. 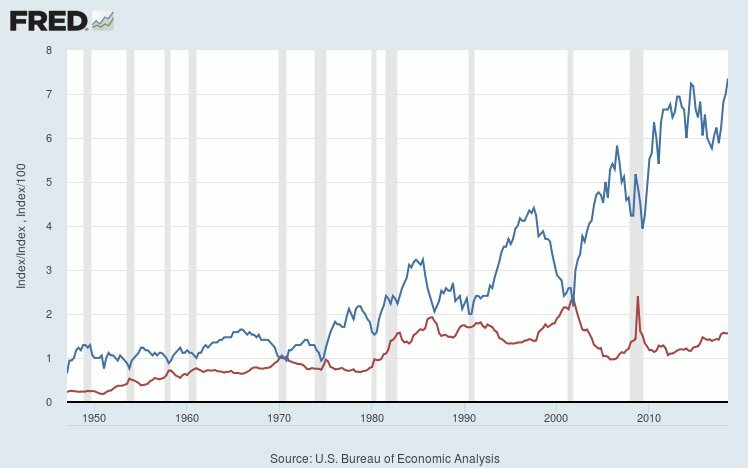 Smoothing this difference would imply near-zero policy interest rates in the long term or accepting two unequal sectors competing in the economy. If government were to consider public enterprise as last resort, it’s hard to see in what would MMT differ from easing monetary policy. Conversely, public intervention is public intervention, with its perils and distortions. A challenge to MMT wonks. It is not hard to recall John Maynard Keynes suggested contractions are the result of sluggish demand rather than price fluctuations back when both money was indexed to metal and productive capital could be destroyed. Monetary financing of public deficits coupled with persistent capital depletion (some demand today that zombie firms be retired) during WWII surely proved Keynes right – would applying Keynes today be equally correct? Surely we do not ignore capital value was determined by its indexing to metal commodities and intermittent capital controls (with corresponding risk premia) when Keynes wrote the General Theory. Should we then ignore the effects low interest rates (thus relative prices) have on exchanges between countries? Robert Kuttner noticed long ago that the end of Bretton Woods’ metal peg (1971) propelled capital flight to unregulated economies, causing violent swings in nominal terms of both US current and financial accounts. The rate of transmission of the US policy rate to the current and financial accounts varied through the years before and after Bretton Woods, the Plaza Accord and the Asian financial meltdown, as visible in the chart above. As such, monetary and fiscal authorities were seldom able to deliver entirely effective demand sustenance (as Keynes suggested was the State’s role) without feedback effects. Consider the link between the current account and the real interest rate. Belloc and Gandolfo demonstrated Obstfelt’s and Rogoff’s prediction of an uneven relationship between current account and real interest rate, when import or export trends impacts prices and thus interest rates, or when the price level differential with other markets engages imports instead of domestic production, is actually observable. Using data for Italy, the authors‘ proof questions the possible effect and reverse effect of monetary policy on the current account, with important implications on the rate of saving and investment – thus on aggregate demand on the long-term. As theorised by Obstfelt and Rogoff, real interest rate differentials between regions in different moments, visible for instance in cross-border value chains, underpin the positive (negative) co-movements of interest rate and current account as demonstrated by the following. These co-movements are visible in both the US and Eurozone. Negative co-movement suggests current account effects dominated the real interest rate until the Louvre Accords that halted devaluation of the USD. In the EU, the current account dominates the real interest rate as the negative co-movement implies a decrease in the interest rate occurs in the aftermath of an increase in the current account. The European economy is, on these terms, completely dominated by the Current Account. As Obstfelt and Rogoff explain, the real interest rate of countries running a current account surplus is below that of foreign counterparts because of expected inflation and the economists’ regression results are complacent with those reported above. Two relevant consequences stem from this observation: using monetary policy stimulus to improve EU investment is likely to increase upward pressure on current account surpluses; explicit investment stimulus policies are more effective than low policy rates. In fact, as lower savings rates correlate with lower investment rates in OECD countries (as remarkably found in work by Feldstein and Orioka), lower ECB policy rates may actually depress investment whilst arguably stimulating consumption. In such circumstance when a stimulus to demand does not entail automatic adjustment of relative real interest rates nor an increase in productive capital – as it did when Keynes wrote the General Theory – perhaps it would be better to explore other stimulus channels. Services are the main driver of the European harmonised price index. Growth in the services sector has been partially motivated by gains in manufacturing productivity and thus has only strengthened with manufacturing relocation. 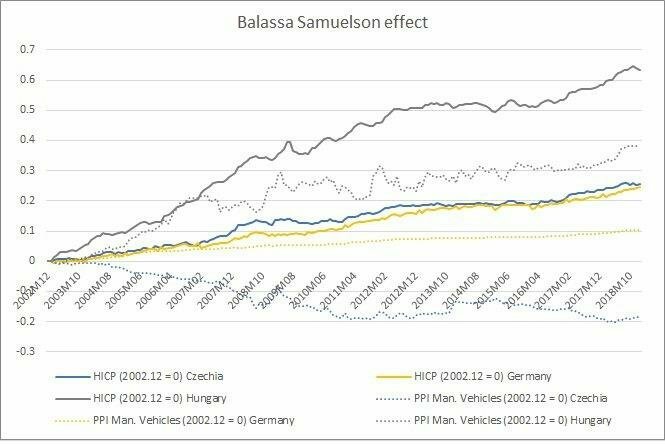 As manufacturing jobs were relocated to where costs are lower, both tamed inflation, capital concentration (although I don’t agree with Blanko Milanovic’s recommendation) and returns of consumption to capital began dominating domestic wage growth effects. For research on economic politics refer to Albanesi. As if following up on the post about Volkswagen and innovation, two brands of the group concluded their technological solution for electric vehicles is so relatively uncompetitive (to Tesla) that the brands’ electric vehicle rollout plans are significantly compromised. These news follow an investment of more than €2 bn to build an electric vehicle platform for the VW Group with delivery scheduled for Q2 2019. What is most worrying is how European vehicle manufacturers used the significant forewarn afforded by the European Commission’s White Paper on Transport. VW is the second wealthiest automobile manufacturer in the world and emissions in Europe are more restricted than in the US since… That’s it, they’re not. This may attest how the EU could reform competition and regulations to the benefit of the European economy. Notice that interfirm competition in the motor vehicle market meets requirements (the VW Group sells to 23% of the European market while DG COMP requires sets the antitrust threshold at 40%); but incentives to intrafirm competition are practically inexistent: low fungibility between assets in different Member-States and market standards as a by-product of the Single Market demand act as counterweights to concentration and crystallised industries. As European firms become dominant, less competitive markets in labour and innovation present no incentive for investment in new skills or technologies. The capital market may somewhat increase gross operating surplus in some countries relative to others (see the recent post on Hungary and Czechia) because competition in input markets is impaired and thus gains accumulate only in capital – ie, research conditions in Czechia are hardly compared with those in Germany. The most significant outcome of the emergence of China as a foreign investor in Europe (rather than a market or a competitor) is the certainty that Europe is the way forward rather than a collaboration of Member-States. The increase in multilateral inter-governmental political bargaining of the past decade, and its significant setback after Donald Trump, reached an hiatus just yesterday as Commissioner Vestager demonstrated the French-German ideology does not necessarily display the most adequate ideas for Europe. Whereas European public good is a debatable concept amongst those that work on it past the political cycle, is it more obvious than in an exclusive competence of the European Commission – the guardian of the Treaties: Competition policy. The request of Germany and France ignores two current facts and assumes the resumption of a trend that is, to a broad extent, past : multilateral economic stimulus. What seems to elude the most fierce advocate of multilaterism is that its main beneficiary, China, is stepping back from its multilateral economic stance in reply to demands for a greater role of domestic consumption in economic growth. Second order effects in raw materials (refusing to continue its role in recycling plastic), rural-urban inequality (the relentless Balassa-Samuelson/Podpiera effects, the politics upheaval), debt are signs that China is closing upon itself. Not understanding that nursing conglomerates contributed to Japanese stagnation or that China can’t be both customer and supplier would be a significant mistake. The French-German offer shows precisely this misunderstanding: that Europe may grow past its size in just a few countries. This same reasoning was very evident in previous years when negotiating Europe. An excessive focus on short-term growth and capital mobility (contrasting with people mobility, in upcoming work) shifted effective per capita growth (household wealth) to the center of Europe leading to the creation of a handful of Chinas in Europe. 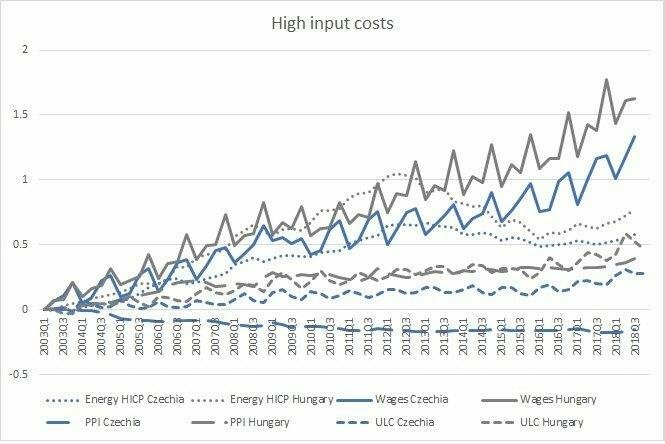 The upheaval of values and firms, of production methods and private initiative in return for relatively low wages as technological dependence – that is the bargain presented to the Czech, Slovak, Polish and Hungarian voter and politician. A bargain that is very known from yesteryear. The election of strongly conservative governments and workers’ demands of higher wages and more pay (Hungary’s extra work law and Audi wage increases) hints at this defensive posture that was aggravated through the past decade as wealthier Member-States, fuelled by media discourses despite the Barroso Commission, dismantled the Union’s principle of compensation to institute another principle of solidarity. What becomes evident is that Europe won’t move forward by maintaining a Europe of yesterday, unproductive and broadly reliant on unfair pay elsewhere, nor by upholding a Europe of tomorrow, over-productive, out of ideas and broadly dependent on external technology and innovation. Both must combine (RSA link here) but there’s little political thrust to do so in as much as the Commission does Member-States’ bidding. The Commission should not behave democratically because it is an institution. That would be the same as saying we should give way in a queue just because fifty people say so – the Commission should hold its place, it upholds the Treaties and doesn’t swing to Governments (and its financiers, today firms tomorrow the people – cf Barrack Obama) but rather defends a higher interest, a more stable moral ground that goes beyond individual State power bargains. That is, for the Commission it should’ve been indifferent that the market net payers bought access to through the European Budget was not paying off and was now causing losses – the losses in itself are solidarity (pay for market access, suffer the consequences of overleveraging) and led to a deep rethinking of the Institutions rather than the institution of a guaranteed return for investment, a so-called solidarity. Make no mistake – EFTA countries pay for market access because the grand bargain of the budget is to compensate poorer countries for the nefarious effects of entering the customs and monetary Union. The converse goes for net payers. But it wasn’t. Either way, it’s clear today Germany and France are not indicating the way forward to Europe – it is doubtful they could, as do most economists. It must be a non-political Commission to do so not by punishing and restricting only but by planning and advancing. We need new Stateswomen like Vestager (and Statesmen too) – not more nationalism, frankly. More pay or better pay? Workers in the Audi Hungarian factory of Györ closed the plant in protest for the lowest wages in the region. Economics is prolific in theories useful to assess the merits of Hungarian workers’ demands. 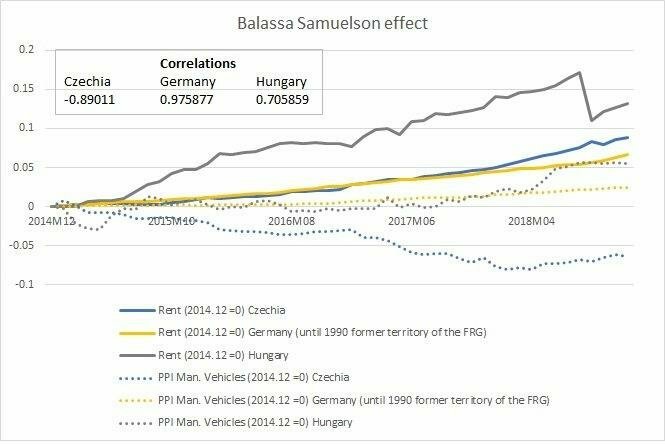 Economists Balassa and Samuelson concluded fast-paced export sectors such as motor vehicles in Hungary lead inflation elsewhere in the economy. In those terms, the Producer Price Index for the automotive industry is significantly and positively correlated for two of the region’s three most dependent on vehicle exports. The pass through is meeker than in the German economy but the positive sign leads to confirm the economists’ theorem. 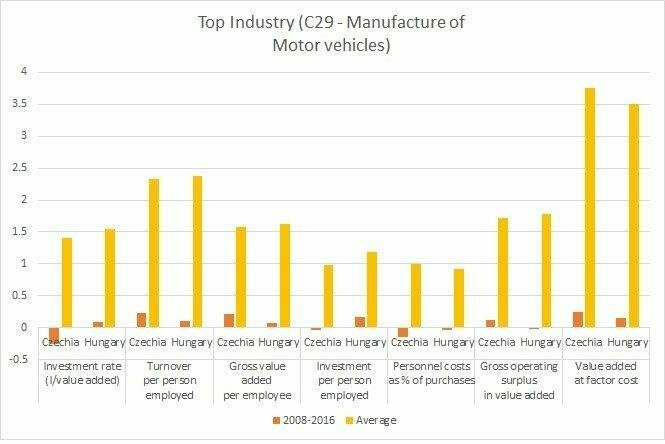 Although remarkable, the economics of Czechia’s motor vehicle manufacturing sector must be the subject of a different post. Jirgi Podpiera documents the rapid qualitative improvement of exportable sector output as causing real exchange rate appreciation and explains sudden inflation increases. The effect is somewhat equivalent to assuming competing inputs increase price pressure on complementary, fast growing sectors of exports economies. 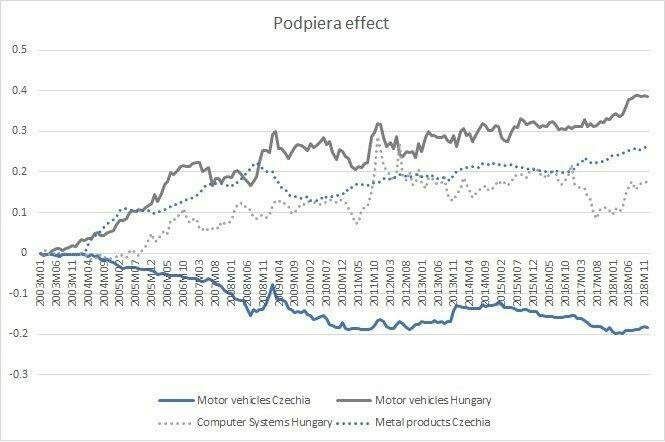 PPI to voth second export sectors in Czechia and Hungary, below plotted with each Member-State’s main export sectors (manufacturing of vehicles) evolve with similar cadence after 2008. More significantly, the main export sector’s PPI tracks price developments in the emerging sector on several occasions. Both intra-sector and cross-sector growth effects impact broader and sectoral price indexes. To assess the merit of wage increases and hint at possible competitiveness losses, it is important to consider whether productivity has evolved with labour costs weighted by costs of other inputs such as energy. In fact, unit labour costs (a productivity measure) stand above labour costs even when weighted by the energy index. Further increasing wages should thus erode competitiveness as other inputs no longer compensate labour costs above productivity. In fact, whereas the Producers Price Index for the of vehicles productivity has evolved with productivity, the trend is sustainable only as costs of other inputs such as energy have container the impact of relentlessly increasing wages in productivity. The evident loss of competitiveness vis-a-vis a regional competitor (Czechia) merits a more refined analysis of its causes. 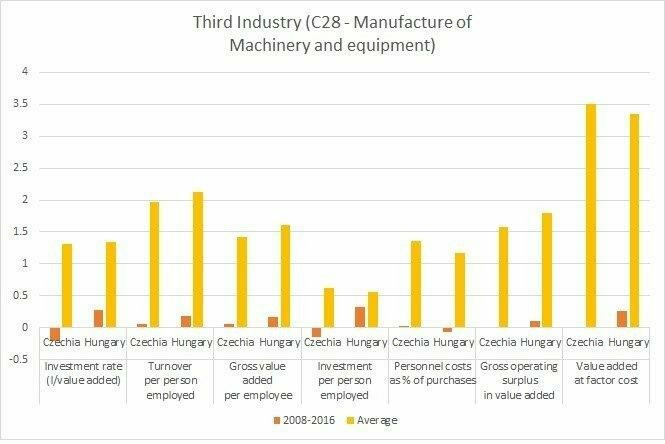 To consider possible transition effects, the analysis is made for both the top and third most export-intensive sectors in both Hungary and Czechia (both charts in log). Upon glance, it is noteworthy that Hungarian industry is both more capital intensive and less effective in producing value added. The discrepancy suggests ineffective investment, lower input of labour to value added and thus the need to increase wages above cost of other inputs, inflation and productivity. 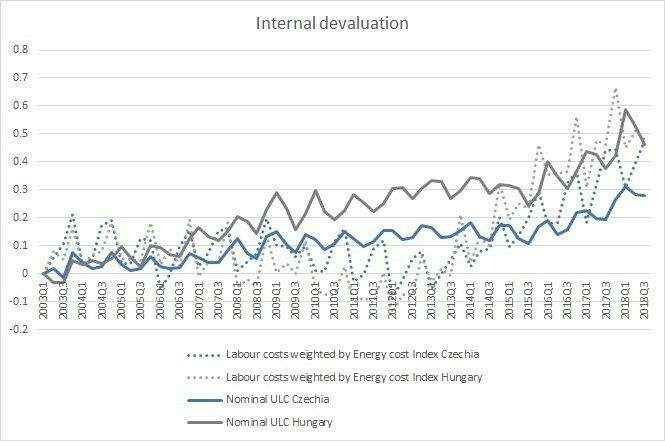 Hungarian workers should strive for more efficient management and spending that converts relatively high value added per employee to higher value added. 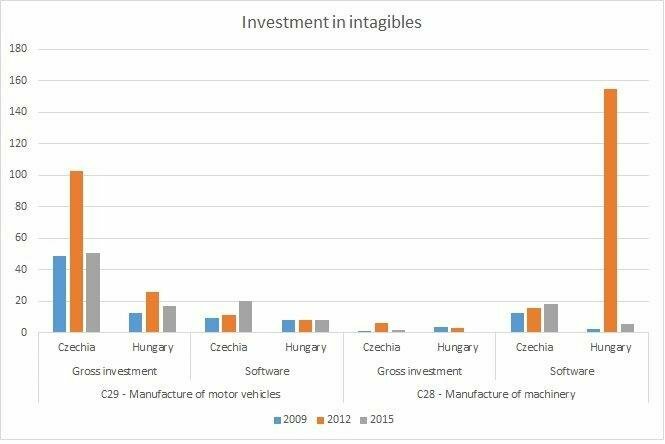 Hungarian vehicle manufacturing industry is more capital intensive and invests more in tangibles than the Czech industry. Its lower labour input inflates gross operating surplus and profits per employee but still lags in total value added – hinting at capital inefficiency, possible the result of lower investment in high-value intangibles, as charted below. US negotiations with China may set the standard for China’s requirements for foreign investing firms. Amongst US demands is the reduction of technology transfer agreements between Chinese and foreign investing firms. The chart below condenses American concerns: unit profits (blue plot) are increasingly less symmetric to firms’ investment in research as a percentage of profits (red plot). Profits are increasingly decoupled of investment in research, possibly implying low value added of research dissuades firms’ investment. The symmetric growth of firm profits and GDP (outweighing investment in research) increasingly seems a past trend of the 1990s and early 2000s. Regardless of co-movement, the evident de-coupling coincides with China’s accession to WTO. Whether American research outputs lower value added dissuading firms or firms found ways to cut costs (eg, by delocalising production) instead of investing in research remains to be seen – even if US concern with research value added is warranted.